The Goethe-Institut Philippinen (German Cultural Center), together with the German-Philippine Chamber of Commerce and other German organizations, are jointly organizing this year’s Mabuhay Germany, an annual fair and exhibition showcasing German quality products, technology and tradition. The fair will take place on Bonifacio High Street in Taguig City on February 21-22, 2015. 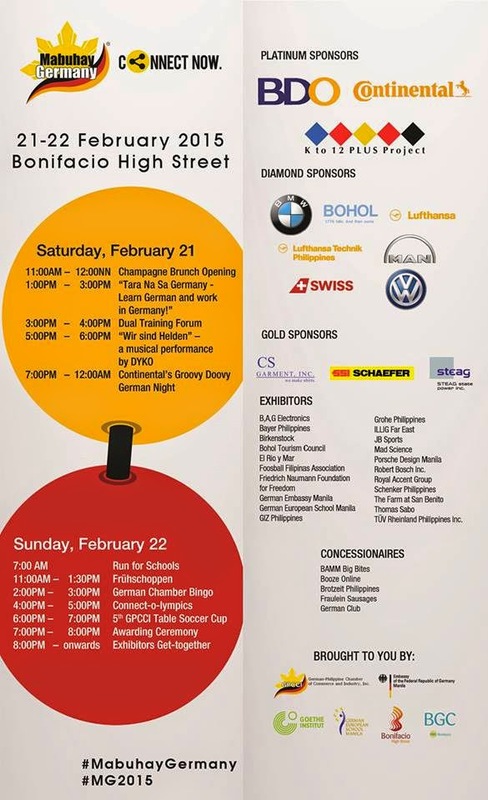 Part of this exhibition is a symposium entitled “Tara na sa Germany – Learn German and work in Germany!” scheduled to be held on Saturday, 21 Feb 2015, 12:00 noon. You can also witness the launch a website specially designed for Filipinos: “Tara na sa Germany!” and have all your questions answered by our expert panel, consisting of the head of the Visa section of the German Embassy, a Filipino with a success story from Germany, an expert in language teaching from Goethe-Institut Philippinen, and other representatives from the German community. We also have a musical performance by DYKO, on 21 Feb 2014 at 4:00 pm, and we invite children from our partner schools to sing a German song with this internationally-acclaimed Australian performer who performs in the German language. There is also a fun run entitled “Run for Schools” hosted by the German European School Manila, who decided that the proceeds of the event would go to their partner schools in their nearby vicinity.